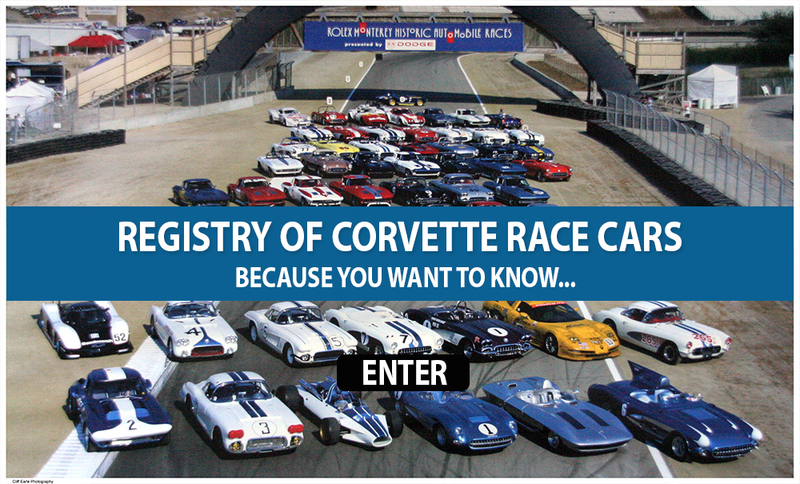 This website and domain, www.registryofcorvetteracecars.com is not connected or affiliated with General Motors Corporation. It includes some words, model names, designations and images that are the property of the trademark holder. They are used for identification purposes only. Corvette is a registered trademark of General Motors Corporation. The content of this website, which includes work product, race car rosters, databases, the Corvette Race Car Series Chronology and worldwide copyrights, is held solely and exclusively by Registry of Corvette Race Cars LLC and may not be replicated or published without prior express written consent of the holder.It is expressly confirmed and agreed by prospective entrants that the Registry of Corvette Race Cars LLC, its owners, officers, employees, partners, supporters, affiliates and assigns, (collectively the “Registry”) make no representations, guarantees, warranties, express or implied, and fully disclaim responsibility for the truthfulness, accuracy, timeliness or completeness of data, information, images, opinions or other materials in this website, regardless of the source of origin. All prospective entrants are required to affirm that they have read and understand the full disclaimer and agree to release, waive, and discharge their rights to sue for claims including lost profits, lost opportunity or indirect, special, consequential, incidental, punitive damages or negligence.